Oh boy, it’s so hot here at the moment. We are sat, (not daring to move for fear of leaking!) The dog is huffing and puffing like an old, asthmatic train and we are listening to rumbles of thunder in the distance as the sky darkens. The wind is lifting and causing a well-needed draught. We’ve had some incredibly hot days recently, I have invested in a bathing costume and used the campsite pool and much to my pleasure there was no one else around so I had it to myself! Just one of the brilliant sunsets we’ve had, Red Sky at Night …. 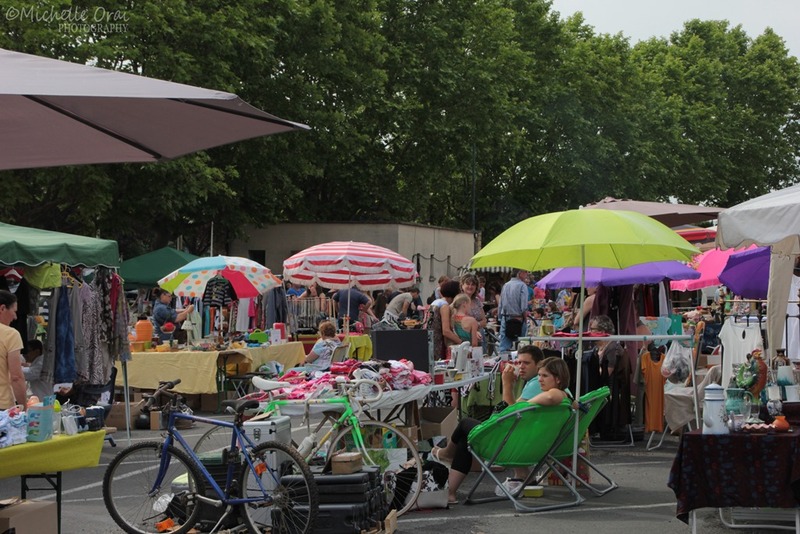 This morning while it was still cool we decided to go to a Vide Grenier, literally an Attic Emptying, or as we say in the UK a Car Boot sale, but people use trestle tables rather than the car boot. 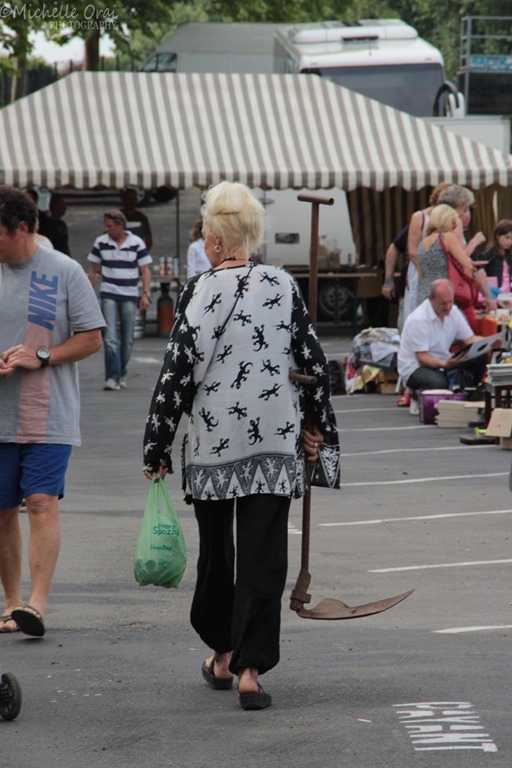 I was expecting to see a lot of tat, but in fact there were some very interesting bits and bobs, it’s just as well we don’t have a house or I would’ve come back laden. I saw some lovely chairs (set of 4) wooden with rush seating ripe for repainting for just 10 Euros!! 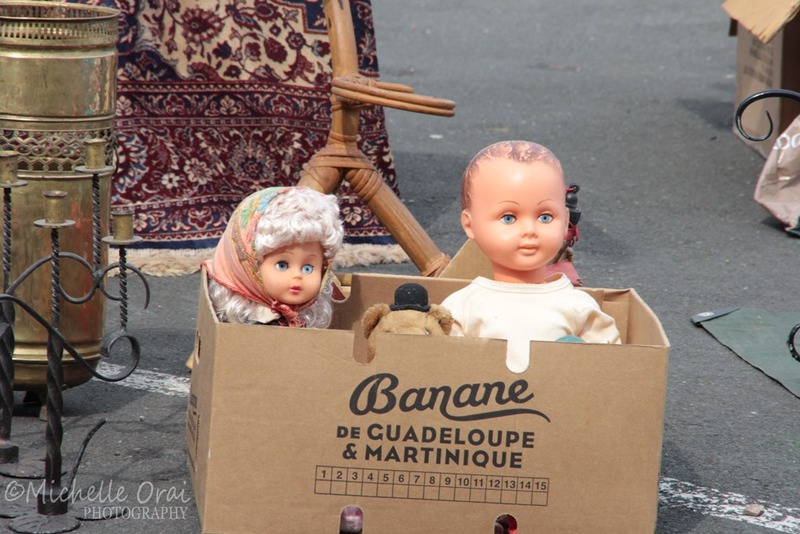 It was a very colourful affair and I believe that the French take these Vide Greniers very seriously, complete with refreshment stall etc..
Not quite sure what you would do with these two! Not quite sure what she plans to do with this either!! We came back to the camp site for lunch and it was just unbearably hot so I shampooed Charlie and hoped that would cool him down. 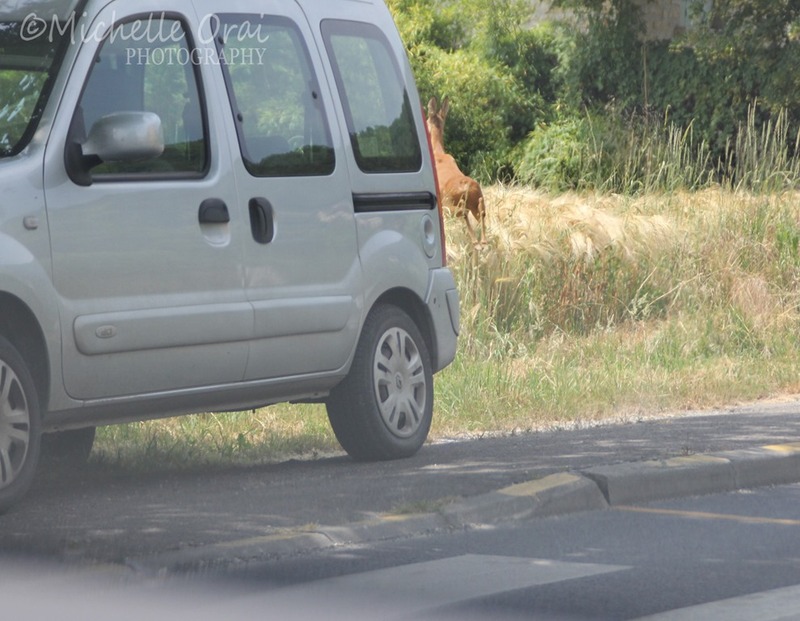 Now, we all know they say you should never leave a dog in a car in the hot weather, well, we decided as he was suffering so much, we would go for a drive! Sounds mad I know – but we brought him in from the boot and popped him on the back seat with his water bowl within reach and then blasted him with the air con, he was chilled and as happy as Larry. (We on the other hand now both have sore throats!) I think Charlie found it a real relief. 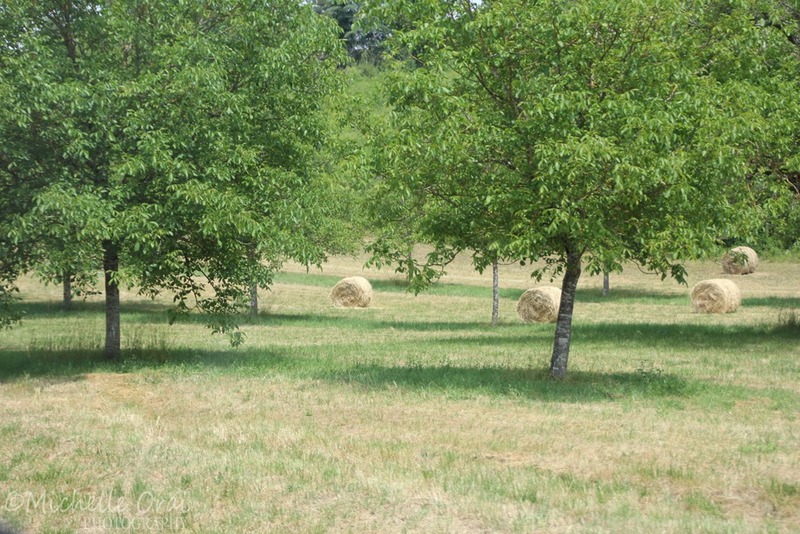 We drove past all the Walnut groves which are so attractive the way they are planted up, and all the farmers have been out making hay over the last couple of days. 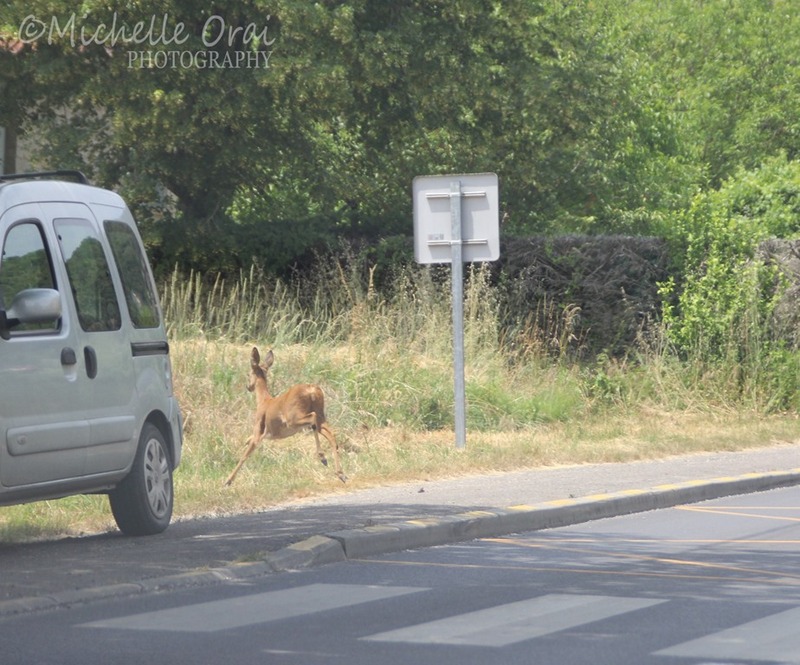 The Hubster did some pretty nifty driving around the Dordogne country roads and was on the ball when this little lady popped out for a wander in the middle of the road!!! Thank goodness he missed her, shame I wasn’t quicker with the camera!! We drove over to La Roque Cageac, which just has to be one of my favourite villages, it never fails to take my breath away and today with the blue sky and the sunshine, it was absolutely stunning, to top it off, the tourist season is now picking up and there were families having picnics under the trees, kiddies paddling, older couples sitting on benches just admiring the view and watching the world go by. 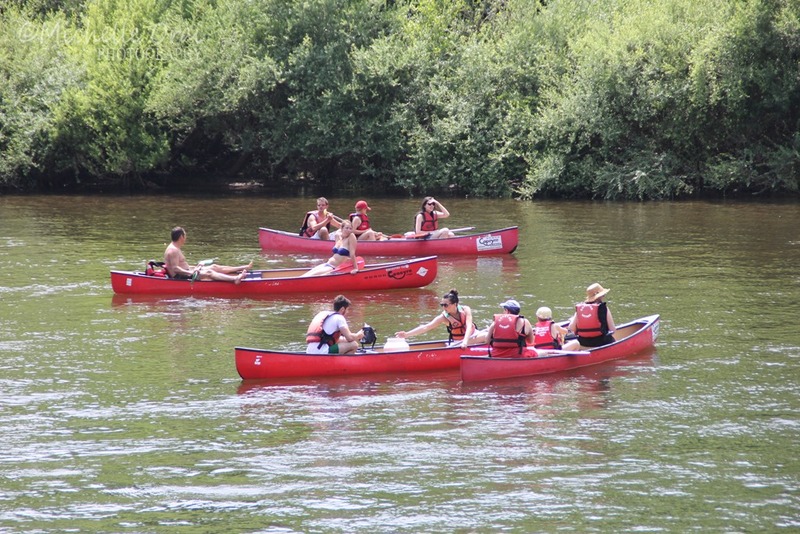 It’s great to see everyone enjoying the surroundings, especially the river itself. 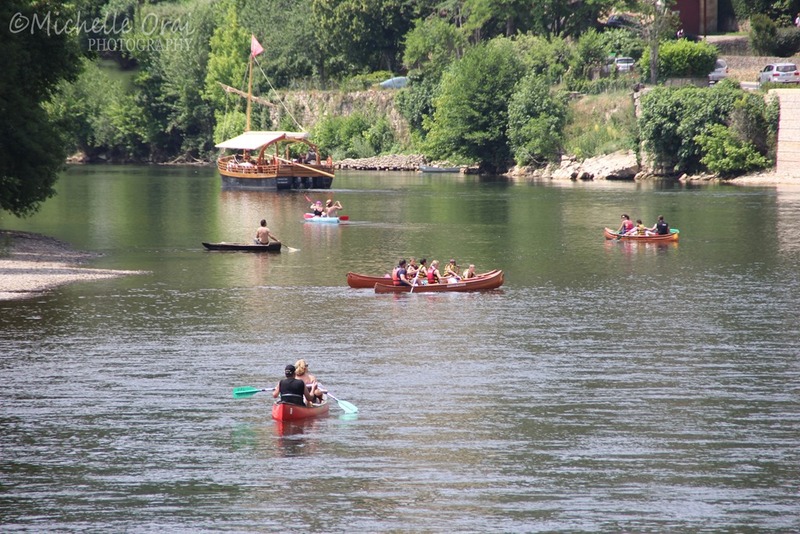 Boat rides up the Dordogne river. Not a lot of rowing going on but how pleasant this must have been. 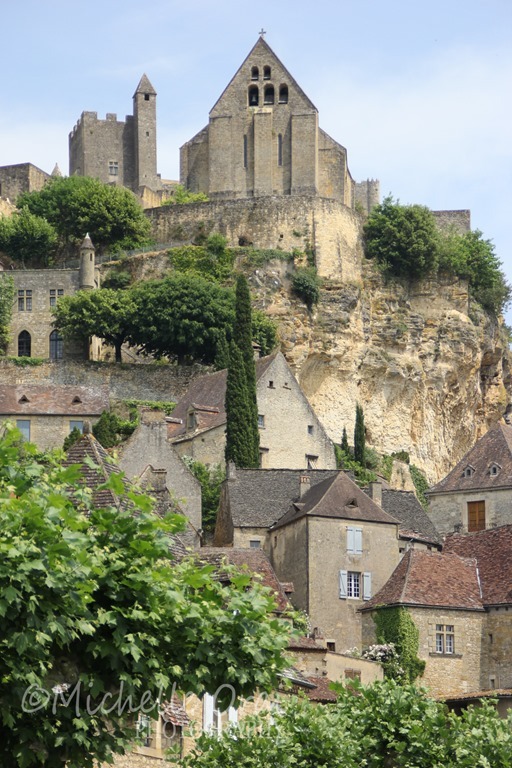 Driving home, I just couldn’t resist a little detour to Beynac, this village is just so picturesque and I think this has to be my favourite castle, so far anyway!! 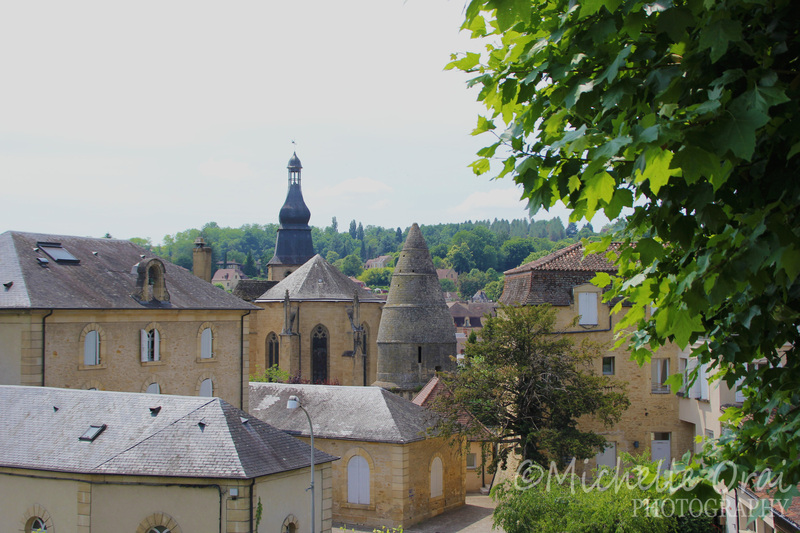 Coming back into Sarlat, we chose a different road, there seem to be so many, this one took us up onto a high road where I jumped out to take a photo of Sarlat from above, as you can see, it is just so beautiful. I love it here. I hope you enjoy these photos, here’s one last one, which may or not seem morbid, but I find graveyards fascinating, this is Sarlat graveyard. There are all of these little. 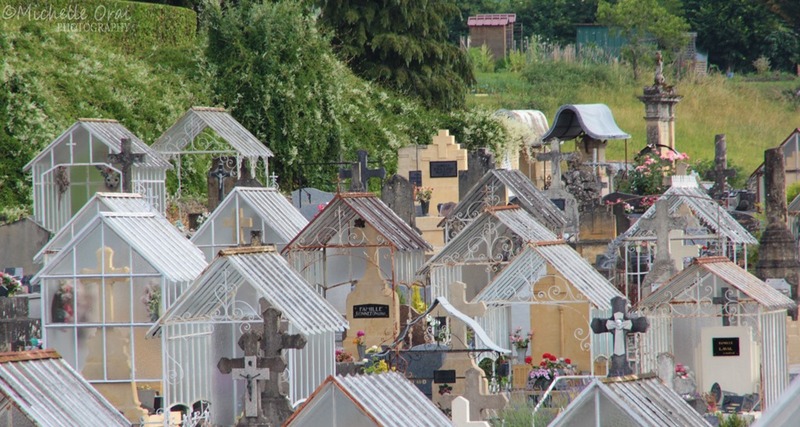 glass shelters over the graves, it reminds me of little greenhouses. I think it looks lovely and peaceful. 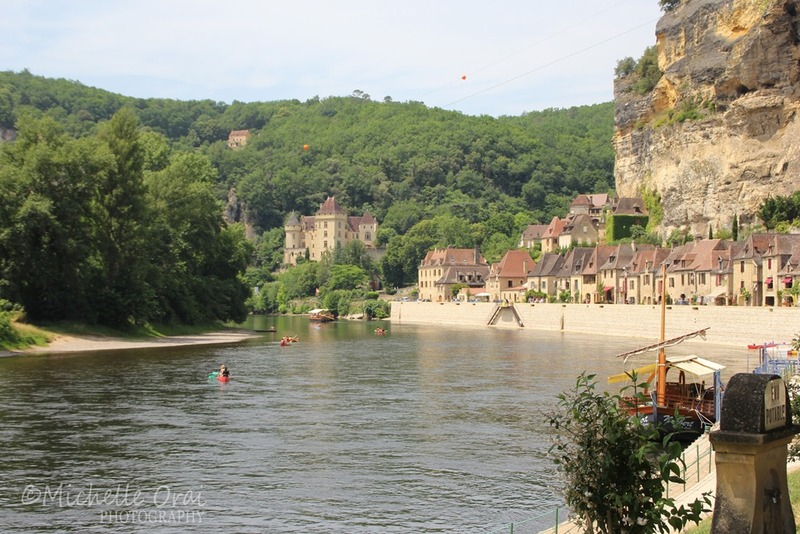 This entry was posted in Daily life, Dogs, Dordogne, France, Hidden Gypsy, Photos and tagged Beynac, blue skies, canoeing, Car Boot Sale, castle, france, heat, hidden gypsy, La Roque Cageac, Sarlat, sunshine, The Dordogne, Vide Grenier. Bookmark the permalink. ← It’s all happening down here! What lovely photos. I’ve seen so many pictures of the castle and didn’t know where it was. Now, I do. 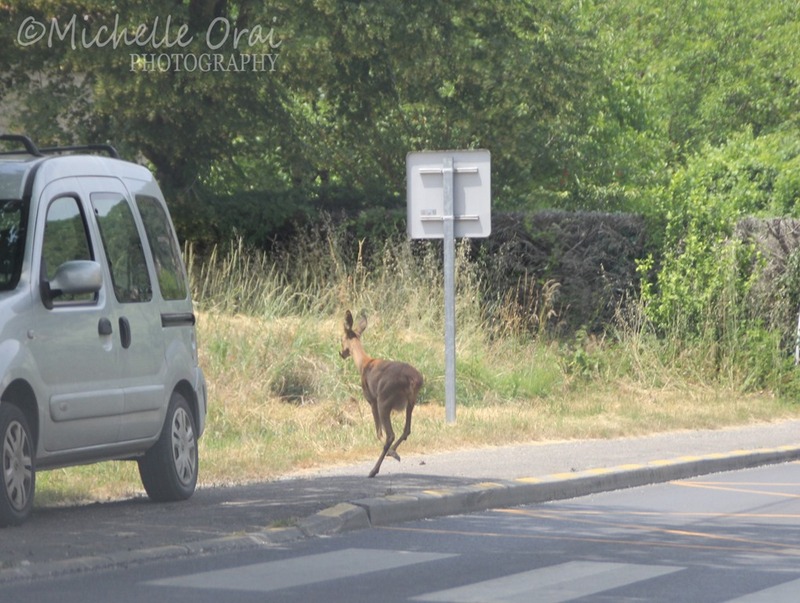 Lucky deer to make it across in one piece. Glad to hear Charlie enjoyed the cool down, though sorry to hear you ended up with a sore throat: What parents of furry children are willing to do. 🙂 Thank you for sharing your charming adventure. Hi Judy, well I’m really low on internet connection allowance so am not blogging as much as I want! Charlie is still going strong although I must admit, I believe he’s had enough 😥 he really doesn’t want to walk at all and we daren’t leave him in the car as it gets so very hot, it’s scuppered our plans a bit, there is so much to see here but we can’t go out when it’s too hot (between 9am and past 9pm!) we have a spell of cool weather on the way so hopefully we’ll get out then! Keeping him and you and hubster in my prayers.